In August of 2014, I met with someone from IFDA Philadelphia asking about printing invitations for an event that their non-profit organization was holding in October, called “Take A Seat“. During the discussion, I became inspired to do something I haven’t done in over 20 years…create art! The event’s proceeds were benefiting Project Home Philadelphia, an organization that aids veterans and helps prevent homelessness. 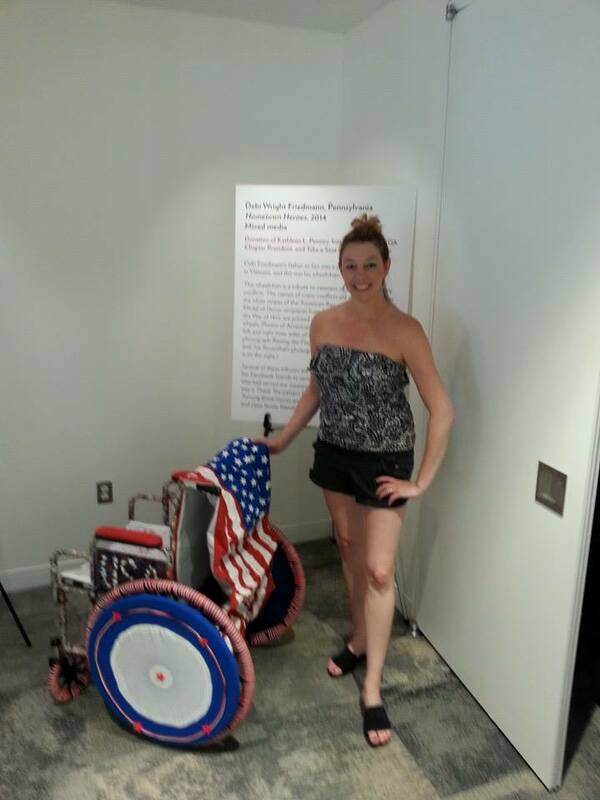 I saw a photo of a flag folded and sitting on a wheelchair and that was the spark I needed to get started! 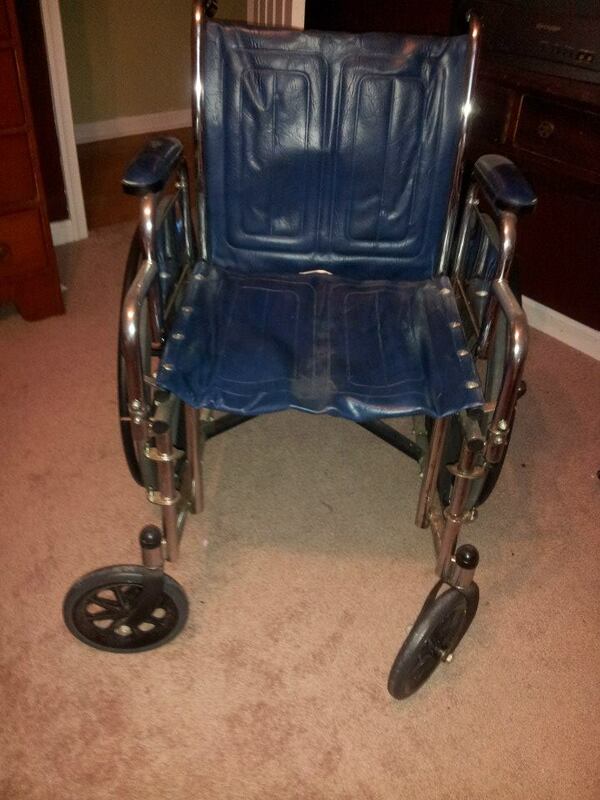 I remembered that I had and extra wheelchair of my father-in-law’s in our basement closet. I pulled it out and got to my creative work! The first part I tackled was the metal sides. It was my first attempt at mosaic, but I wanted USA to be seen prominently. Next, I envisioned a flag on the back of the chair that was waving. A friend of mine suggested that I incorporate the names of all the conflicts our military has been a part of. 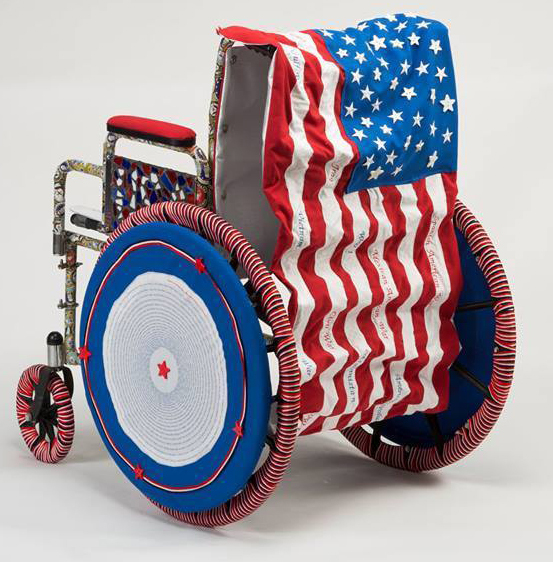 I embroidered these in the white stripes of the flag and sewed wire into the stripes so that I could make the flag wave. Since I own a printing company, it was easy for me to collect the seals for all 5 branches of our military service and print them onto circular stickers. 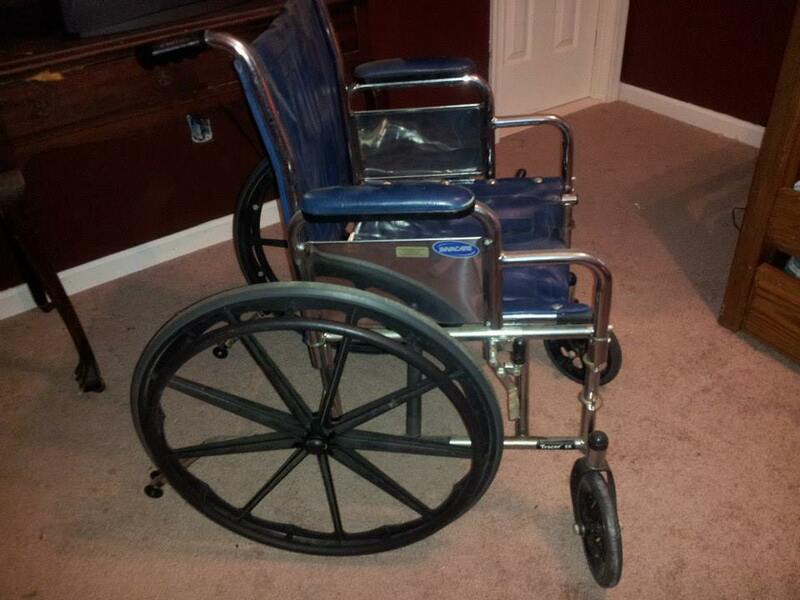 I used these stickers to cover all the metal parts of the wheelchair, then put a layer of Mod Podge over those parts to seal them. I contacted the local Chester County veterans office for a list of names of local military, but was told that it was confidential information. So I found a website that listed all the medal of honor recipients from the state of PA that dated back to the War of 1812. I took those names and created a spiral design in Illustrator, then printed it onto white fabric with Blue Dog’s direct to garment (DTG) printer for the wheels. On September 11th, I posted a request on Facebook for people to send me the names of loved ones that have served our country, past and present. I took all these names and designed a Thank You pattern that thanked each person individually. Among these names are both of my grandfathers, my cousins and close family friends. I printed these out on white fabric and used them to create the seat and the back. Lastly, I printed out a photo of soldiers planting our flag in Iwo Jima, then another of our flag being raised over Ground Zero to signify the timelessness of what our flag represents to Americans. I decoupaged these images to the inside of the metal sides. 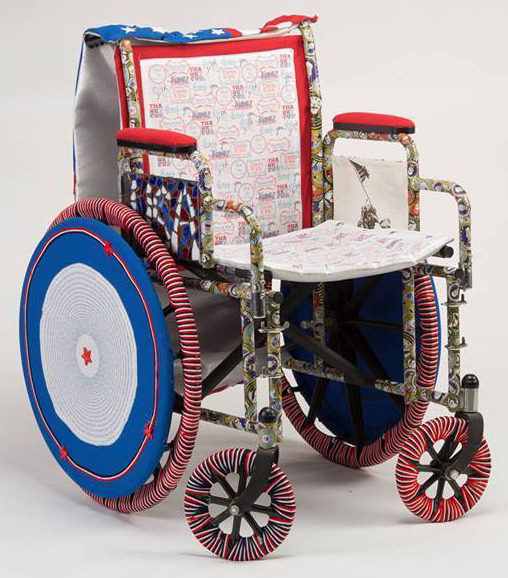 A week before the event, I got an email telling me that the committee chose my chair for the live auction finale piece…I was blown away! I immediately put a call into Malena’s for a unique outfit to wear. After anxiously awaiting for the finale on October 10th, my creation sold for over $1,200. I was so excited and felt accomplished. 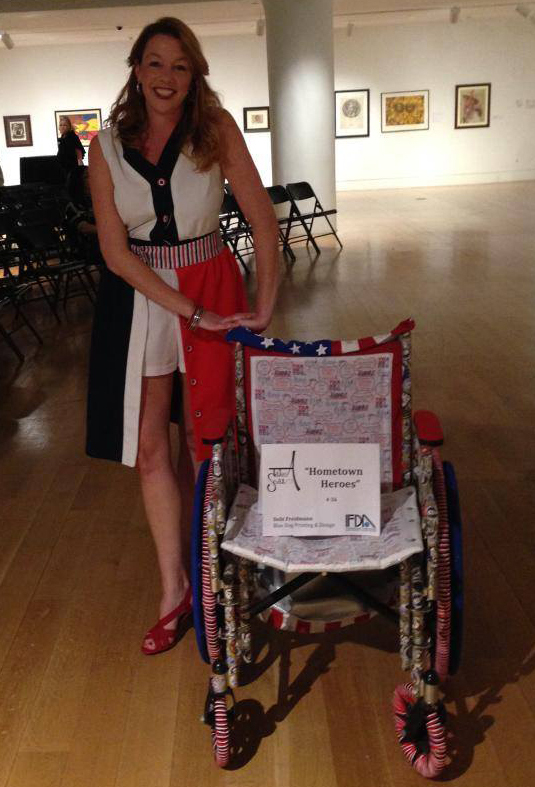 Little did I know that the person who purchased the chair donated it to be put on display at the National Liberty Museum in Philadelphia. How fitting that I found this out on Veteran’s Day!